- Coolant is the REAL Lifeblood of your engine. Coolant is the REAL Lifeblood of your engine. Over time, motorists have gotten the idea that engine coolant matters just twice a year… preparing for winter, and setting out for summer. But the truth is coolant has little to do with the outside temperature, and everything to do with the internal temperatures. Coolant is the TRUE LIFEBLOOD of your engine. If an engine runs just 18 degrees above or below normal operating temperature, you can risk serious and costly damage. Because the cooling system is connected throughout your engine, keeping the right coolant chemistry and maintaining proper coolant levels needs to be a top priority for sustaining the overall health of your vehicle. Snap a pic of you checking your coolant reservoir for a chance to win monthly PEAK swag and two VIP NHRA tickets to a 2019 race! Complete your Doctorate Degree of Coolant to earn $500 towards your #MechanicalEmergency. 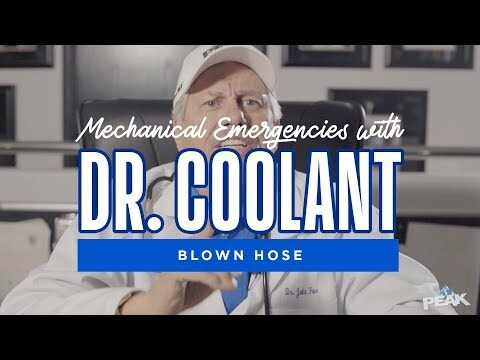 John Force AKA Dr. Coolant is treating mechanical emergencies all around this great country. Check out the episodes below to learn how you can prevent #MechanicalEmergencies. Have a #MechanicalEmergency? Tweet us using #MechanicalEmergency and John Force may share your story in his next episode. Learn the ins and outs of Coolant. Click the questions below to learn more about Coolant and the important role it plays your vehicle's engine. How does coolant work and why does my engine need it? normal, you can risk serious and costly damage. How do I check the condition and level of my engine antifreeze/coolant? 1) Before starting, locate the radiator, coolant overflow reservoir, and pressure cap. The reservoir will be located at a high location on either side of the engine and may be near the radiator or at the back of the engine near the windshield. 2) The cooling system pressure cap may be on a remote overflow reservoir if not on the radiator. With the engine off and cool, remove the pressure cap from the radiator. The coolant level should be at the top of the radiator, ideally flush with the bottom of the pressure cap seat. If the coolant level is low, add either 50/50 pre-mixed antifreeze/coolant or a 50/50 mix of antifreeze/coolant concentrate and good quality water until the coolant level reaches the cap seat. Replace the pressure cap. Next, check owner’s manual for recommended cooling system maintenance, and note the guidance given for the level of antifreeze/coolant to be kept in the reservoir. Locate the fill line on the side of the overflow reservoir. If the coolant level is low, remove the reservoir cap and add either 50/50 pre-mixed antifreeze/coolant or a 50/50 mix of antifreeze/coolant concentrate and good quality water until the coolant level reaches the level marked on the tank. Replace the cap. Make sure the engine is off and cool. Check owner’s manual for recommended cooling system maintenance, and note the guidance given for the level of antifreeze/coolant to be kept in the reservoir. Locate the fill line on the side of the tank. If the coolant level is low, remove the pressure cap and add either 50/50 pre-mixed antifreeze/coolant or a 50/50 mix of antifreeze/coolant concentrate and good quality water until the coolant level reaches the level marked on the tank. Replace the pressure cap. For more information and videos on engine coolant maintenance, check out our DIY videos. Replace pressure cap and run engine 15 minutes with the heater on high. Stop engine. When engine has cooled, check freeze protection and add more antifreeze/coolant concentrate or water as necessary. How do I top-off my vehicles antifreeze/coolant? Prepare a 50 to 70% mixture of Antifreeze + Coolant concentrate and water. Add mixture to the overflow reservoir to the level marked on the tank. DIRECTIONS Follow these directions when using a 50/50 pre-diluted antifreeze product. Check vehicle owner’s manual for specific cooling system maintenance recommendations. Note: The pressure cap may be on a remote overflow reservoir if not on the radiator. Remove pressure cap and add PEAK 50/50 Prediluted Antifreeze + Coolant to the overflow reservoir to the level marked on the tank. Replace cap. Periodically check radiator and reservoir coolant levels and freeze protection, and top off as needed.